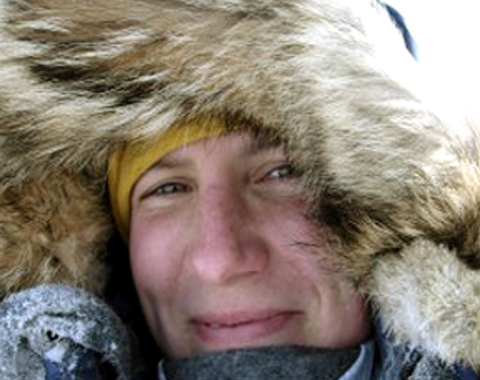 Felicity Aston is one of the rare women explorers to have been able to combine scientific jobs -she has worked as a meteorologist for the British Antarctic Survey (BAS), for example- and her taste for great adventures. Felicity's first 'expedition' involved being bribed up Helvellyn at the age of nine by her parents with a packet of Opal Fruits. The sense of achievement on reaching the top was slightly lost in the pouring rain but something about the experience must have stuck. At the end of her first year reading Physics and Astronomy at University College London (UCL), Felicity joined a British Schools Exploring Society expedition to south-west Greenland. After spending 3 weeks mapping the archaeological remains of Viking settlements, her team was supposed to spend a week exploring Greenland's inland ice. They made it to the fringe of the ice-cap before having to turn back. Felicity remembers looking over her shoulder at the ice as they left and promising herself that one day she would make it over that white horizon. Two years later Felicity travelled to a remote part of northern Quebec with a small group of students to search for evidence of meteorite impact craters. The expeditions findings were inconclusive but the wilderness experience (which included the team's hired boat being destroyed when it was struck by lightning) taught her a lot about being prepared for the unexpected. Completing her first degree, Felicity went on to gain a Masters in Applied Meteorology from the University of Reading before landing her first job -a meteorologist with the British Antarctic Survey. Felicity spent two and a half continuous years in the Antarctic, living and working at Rothera Research Station on the Antarctic Peninsula between 2000 and 2003. As well as monitoring ozone depletion and climate, her job involved looking after a small outpost and aviation re-fuelling depot during the austral summer. This meant that, at times, Felicity and a colleague were the only two people on an island roughly the size of Wales, at least 250 miles from the nearest other human. Felicity left the Antarctic and travelled home through South America. Arriving back in the UK she became the Expeditions Officer for the oldest youth development charity in the UK, BSES Expeditions. Her job involved organising the logistics of large-scale scientific expeditions for young people to places like Svalbard, Africa and the Andes. Since 2004, Felicity has established herself as a freelance travel writer for both magazines and travel publications but she has continued to organise and lead her own expeditions. Over the last 4 years Felicity's projects have been awarded the Captain Scott Society 'Spirit of Adventure Award', a Wilderness Award and a Timberland 'Make it Better' Scholarship as well as earning support from the National Geographic Expeditions Council in the US. In the UK, she has been made a 2008 Churchill Fellow by the Winston Churchill Memorial Trust and an honourary member of The Commonwealth Club. Felicity believes in the value of the expedition experience to personal development and is keen to encourage others to go in search of their own adventures. She currently sits on the Council of the Young Explorer's Trust, the UK's national association of youth exploration societies - a national charity dedicated to promoting safe and responsible expeditions for young people. Felicity also acts as an Ambassador for two inspiring organisations - the British Antarctic Monument Trust which aims to commemorate the achievements of the men and women whose scientific exploration in Antarctica has led to a new understanding of our planet, and to honour those amongst them who did not return - and Equaladventure which provides support for individuals and organisations striving towards inclusive participation in sport and adventure. At 23, Felicity left the UK to spend three years living and working in the Antarctic as a meteorologist with the British Antarctic Survey. At 27, she was part of the first all-female team to complete the Polar challenge, a 360-mile endurance race across the Canadian Arctic. A year later, Felicity led the first British women's crossing of the Greenland ice-sheet. Now 32, she has just returned from successfully leading the Kaspersky Lab Commonwealth Antarctic Expedition, the largest and most international women's expedition ever to ski to the South Pole.